This property was owned by an elderly lady who had moved out of the property a number of years ago to live with another family member. The property had been the subject to repeated vandalism and was deteriorating further. The owner was not in a financial position to renovate the property and was not in the best of health, making re-development of the property impractical. The owner after much negotiation decided to sell the property. 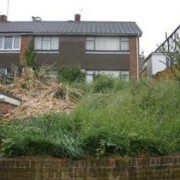 To facilitate this the Council arranged for the property to be cleared and the owners belongings put into storage. This would enable the property to be sold at auction. The No Use Empty Scheme and the District Council’s work in partnership with Clive Emson auctioneer‘s. If the property has been identified as a long term empty and is sponsored by the Empty Property Officer, then the Auctioneer will offer to sell the property through auction at reduced fees. If you think your property is suitable for selling in Auction and is a long term empty property, then please contact your local Empty Property Officer, to assess whether you would be eligible for this discount. The above property was placed into Auction and sold well above its guide price. When the hammer falls at the auction, it establishes an agreement of a binding contract between buyers and seller. The buyer must pay 10% of the total sale price of the property before leaving the auction house and completion is usually within 28 days. This method of selling property is particularly suitable for unmortgeable properties or properties in very poor condition. The developer carried out a comprehensive programme of works, to bring the property back to its former glory. The property has recently been re-sold and is a home to a local family.